Crafting wood is a part-time venture for me; it is certainly not a profit-making enterprise nor do I expect things to go in that direction. Because of the nature of my venture this site was not built to drum up business. 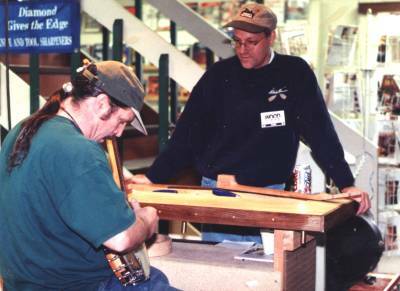 I get a lot of questions about how I build instruments and there seems to be a lot of curiosity about the shop itself, so I decided to go online to give people a peek into my woodworking world. My shop is in the basement of my house, and for that reason, I have decided to keep my name and its location off the Internet. I tend to be a private person by nature, so even having this website is a big step for me. I’ve since decided that it would do no harm to have my first name on the website. 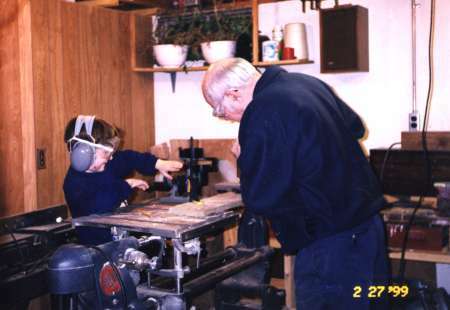 This is my nephew, Joel, learning about woodworking from the same guy who got me started--my dad. In the foreground you can see his Shopsmith, which has been the workhorse of his shop for about fifty years.